The property market continues to show a continued tightness as highlighted in the April NZ Property Report with fewer new listings coming onto the market in the past month. Just 9,993 listings were added to the website in the month of May down 5% as compared to April and down 29% as compared to May 2008. This steady decline of listings witnessed since February is resulting in inventory levels declining as the recent uplift in sales is significantly eating into available stock of properties on the market – a scenario echoed by most real estate agents around the country. The resultant inventory of available listings when represented by the number of weeks of sales is currently sitting at 35 weeks (just over 8 months). This is down on both the March and April inventory levels of 52 and 42 respectively; and now represents a level below the average of the past two and half years at 38 weeks. This new metric of inventory as expressed as the number of weeks of sales has been introduced to the report this month to bring perspective to the number of listings coming onto the market. Over the past two and half years the levels of inventory on the market has varied between lows of 20 weeks in the first half of 2007 right up to a peak in February of this year of 57 weeks. This latter figure very much influenced by the very low rate of property sales through the Nov / Dec / Jan period. In terms of the asking price expectation of vendors of newly listed properties; the May truncated mean figure of $401,196 represents a fall of 1.2% from the April asking price expectation of $405,936. Further it represents a fall of 1.7% as compared to an average of the prior 3 months (Jan/Feb/Mar). The asking price in May 2008 was $414,539 which represents a 3.2% year-on-year fall in asking price. The trend highlighted in the prior month’s report of a significant fall in listings pointing to a turning point in the market continues to be the view of the market in May. As compared to the April level of 10,453 new listings, May saw even less listings even allowing for the traditional winter slow down of new listings just 9,993 new listings were added in the month. Comparing seasonal movements over the past 2 years – May as compared to April; this year represented a fall of 4.6%. The same period for 2008 showed a fall of 11%, and in 2007 a rise of 5%. This fall in new listings has led to the available stock of properties on the market falling to an inventory level of just 35 weeks, this compares to an April level of 42 weeks and a level of 45 weeks recorded in May 2008. This level of 35 weeks compares to an average inventory over the past two and a half years of 38 weeks, during which time the level has moved within a range with a low of 20 weeks and a peak of 52 weeks. Measured against the prior 3 months average amongst the 19 regions across the country, 7 reported price declines with 7 reporting price increases – the balance of 5 regions showed little appreciable change. The highest price growth was seen in the Wairarapa with a 10% increase to $286,898; this actually puts the region’s asking price back to December levels following low asking prices in recent months. Biggest fall in asking price was seen in the Coromandel with 7.4% decline, this region also saw a rise in new listings. Potentially more realistic pricing of new listings may be contributing to this fall as vendors try and compete with a large inventory of homes for sale. Only 2 regions showed an increase in new listings as compared to 13 regions showing falls in listings of more than 20% as compared to May 2008. Marlborough, Southland and Gisborne all have seen new listings for the month of May fall by around 50% as compared to a year ago. In overall terms the comparison against the same month last year is beginning to show some slowing of the major variances seen in the April report primarily as the prior period begins to reflect the changed sentiment seen in 2008 when sales had consistently fallen for over 4 months and vendors began to show hesitancy in adding their property to an already overcrowded marketplace. The overall inventory has fallen for 3 straight months since the peak in February of this year with 57 weeks of inventory base on the rate of sale – a total of 62,522 property listings. In May the inventory of property listing totaled 56,114 which at the current rate of sale equates to just 35 weeks of inventory. Across the country the inventory levels vary widely with the Coromandel region highest with the equivalent of 182 weeks (over 3 years of listings). Equally Northland, Central Otago Lakes and West Coast have over 100 weeks (2 years). At the other extreme the areas with the lowest levels of inventory are Wellington with 16 weeks, Taranaki – 20 weeks, with Nelson and Otago with 23 weeks apiece. Areas representing the tightest market in respect of current inventory as compared to long term averages would be Nelson, Wellington and Canterbury. Equally those areas with a proportionally high level of inventory would include Southland, West Coast, Gisborne and Northland. New listings for lifestyle properties totaled 914 in May as compared to 906 in April. As measured against May 2008 the level of listings is down 15%. The asking price for lifestyle properties in May was $577,501 this represents a 0.8% fall as compared to April and a 4% fall as compared to the most recent 3 month average. Listings for apartments shows a 17% increase as compared to April with 473 new listings in May as compared to 405 in April. As measured against May last year shows a 25% fall. A total of 304 new listings of apartments in Auckland came onto the market in May representing a 22% increase as compared to April and a 16% fall as compared to May 2008. The asking price for apartments in May was $396,363 representing a 6% rise from April. As compared to the prior 3 month average the May asking price shows a marginal increase of just 0.5%. The asking price for Auckland apartments in May was $352,620 this was a 12% increase as compared to April which itself was a surprisingly low asking price level. When compared to the most recent 3 month average May showed a 4.8% increase. The full report can be downloaded here (1MB pdf document). The next NZ Property Report will be published on Wednesday 1st July at 10am. The realestate.co.nz NZ Property Report aims to provide a new perspective to the information on the residential property market in NZ. Realestate.co.nz is uniquely placed to provide relevant and timely information on the state of the market from the perspective of the lead indicators of price expectation and the quantity of new listings coming onto the market. These unique indicators will, it is believed, provide a valuable balance to the established indicators of sales volumes and property selling prices. This second report from realestate.co.nz provides an insight into seller activity in the residential market for the month of April 2009. This report also introduces a change in the presentation of asking price. Following consultation with economists the decision has been taken to utilise a ‘truncated mean’ asking price as a more accurate guide to asking price. The level of new listings coming onto the website in April slipped to a seasonal low of just 10,453. Traditionally April is a quieter month for new listings, as evidenced by the listings data for 2007, which provides a more reliable measure of seasonality than 2008, which was a year heavily influenced by a massive contraction in sales and the consequential impact on inventory on the market. This lower listing inventory which has been seen as a trend for over 12 months, matched to the recent awakening of sales in February and March, could mark the end of the buyer’s market which is how the property market has been typified over the past 18 months. Whilst there is no clear sign that the market has entered into a sellers market phase with any consequential impact on prices, there has to be a point of inflection and that is a sense of where the market currently is. The asking price expectation in many ways supports this turning point, as the asking price expectations are not perpetuating the declines seen through 2008, rather it is as though it is seeking direction as the market heads into the traditionally quieter winter period. The national decline of new inventory is reflected right around the country with year-on-year double digit decline. The only exception is Nelson which traditionally has maintained a very active property market and coincidentally Nelson recorded one of the leading increases in asking price – up 13.8% for the month as compared to April 2008. The biggest fall in new inventory was recorded in Northland down 56%. The Auckland market, representing as it does over a third of inventory experienced a decline of 1,689 listings as compared to April 2008 and 1,369 as compared to April 2007. Across the regions, asking prices in the main slipped with 12 regions reporting price declines (largest fall 9.8% in Marlborough) and just 6 reporting an asking price increase. The largest rise was in the West Coast with a 22.4% year on year growth to an asking price of $279,882. Whilst March saw renewed activity in the listing market for apartments, April had seen a marked reversal with one of the lowest months of the past 2 years. Just 405 new apartment listings were added to the website, reflecting somewhat of a seasonal decline, and yet is 37% down on April 2008. In terms of asking price, the April figure of $372,865 is down a significant 16% as compared to April last year, and an equally significant 15% from last month. Clearly the apartment market is struggling to generate much supply side activity outside of the lower priced segment. Mirroring the comments of March, lifestyle property continues to show sluggish activity of new listings. A total of 906 listings were added in April down 32% on April 2008. A seasonal decline in listings is anticipated at this time of year but this decline month on month of 13% is ahead of 2007 and 2008. In terms of asking price, the April figure of $581,938 is up slightly by 3% as compared to April last year, and pretty much line-ball with the March asking price. Realestate.co.nz: data compiled from asking prices of new residential listings as they come onto the market via subscribers to the realestate.co.nz website. Realestate.co.nz website currently has over 93% of all licensed real estate offices subscribing and providing all of their listings onto the website. The asking price is presented as a truncated mean price at an 80% interval. REINZ: data compiled from reported unconditional residential sales from all members of the Real Estate Institute of New Zealand representing all licensed real estate offices. The sale price is a median price. QV: data compiled from residential sales compiled by QV for the previous 3 month period. The sale price is a pure average (mean) price. The monthly asking price for new listings presented in this report utilises the measure of ‘truncated mean’. This measure is judged to be a more accurate measure of the market price than average price as it statistically removes the extremes that exist within any property market that so easily can introduces a skew to traditional average price figures. With the largest database of properties for sale in NZ, realestate.co.nz is uniquely placed to immediately identify any changes in the marketplace. The realestate.co.nz NZ Property Report is compiled from new listings coming onto the market from the more than 1,120 licensed real estate offices across NZ, representing more than 93% of all offices. With an average monthly level of over 12,000 new listings, the realestate.co.nz NZ Property Report provides one of the largest monthly sample reports on the residential property market, as well as a more timely view of the property market than any other property report. The data is collated and analysed at the close of each month, and the Report is compiled for the 1st day of the following month. This provides a feedback mechanism as to the immediate state of the market, well in advance of sales statistics which by the very nature of the selling process can reflect activity with a lag of between 2 and 4 months. In analysing the details of the 10,453 new listings in the month of April, a total of 262 listings have been excluded due to anomalies. The categorisation of Lifestyle property is defined by the land area of the property. The criterion is a property having in excess of 0.3 hectares and being situated outside metropolitan areas. The Realestate.co.nz NZ Property Report aims to provide a new perspective to the information on the residential property market in NZ. Realestate.co.nz is uniquely placed to provide relevant and timely information on the state of the market from the perspective of the lead indicators of price expectation and inventory of listings as well as new listings coming onto the market. These unique indicators will it is believed provide a valuable balance to the established indicators of sales volumes and price as well as property values currently provided by other services. 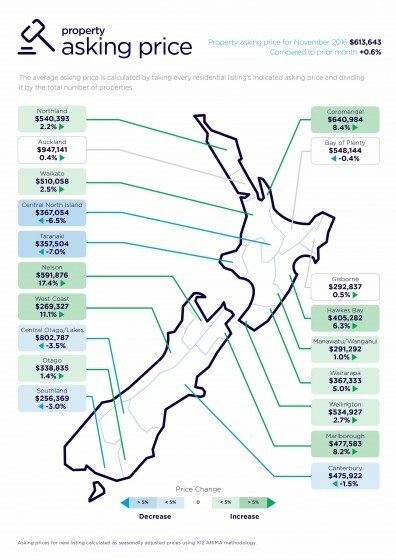 This first report from realestate.co.nz provides an insight into seller activity in the residential market for March 2009. New listings added to realestate.co.nz in March show renewed interest in the property market with 13,284 new listings coming onto the market. Buoyed by low interest rates (which have of course abruptly turned in the last week of the month) new listings picked up with a 9% growth on February, but still some 19% below last March. For the second consecutive month the price expectations of sellers rose, reversing the downward trend seen during the latter half of 2008. At $399,000 the median asking price was 1.0% up on March 2008 and equal to the peak of October 2007, albeit on a lower volume of listings (October 2007: 16,753 new listings). An interpretation for this rise in asking price requires an understanding of the motivations of sellers and real estate agents. The sellers see media coverage presenting a degree of property market resurgence albeit with falling prices. With limited numbers of new listings, agents are eagerly courting sellers to win listings. With sellers eager not to capitulate on sale price they set a higher asking price in the knowledge that they can negotiate down to the buyer’s expectations. Agents counter this by informing sellers that property is only selling when priced to the current market but ultimately often fail to convince sellers when threatened with potentially losing the listing. The outcome is a divergence between selling price and asking price – a hope is that the presentation of these facts in this report for the first time will bring attention to seller’s expectations to enable greater visibility and transparency in the market. Across the country the results show a consistent decrease in new listings as against March last year. The only exceptions are in the regions of Coromandel, Taranaki, Central Otago Lakes and Gisborne which all reported increases in new listings. In terms of asking price of new listings the country is fairly evenly split with 9 regions showing reduced asking price and 9 regions showing increasing asking price just pushing the national median asking price up the 1.0%. Major asking price movements were seen in Coromandel down 12.0% with Wellington and Southland showing asking prices down 3.5% and 4.4% respectively. On the increasing side it is interesting to see asking prices in the 4 tourist hotspots of Northland, Gisborne, Otago Lakes and Nelson showing increases of over 10%. The market for apartments shows a greater level of activity with 658 new listings coming onto the market a sharp rise from the lows in January of just 350. Measured against March of last year the new listings are exactly matching that period which was the start of a steady decline through 2008. In terms of asking price the March figure of $409,000 is up 6% as compared to March last year and a massive 22% up from February although it is important to recognise the low volumes and diversity of listings within this sector of the market. The market for lifestyle properties represents just 8% of all listings and in terms of new listings is showing the most lackluster activity. Just over 1,000 new listings came onto the market in March – down 21% from March 2008 and recording only a 3% increase on last month. In terms of asking price the March figure of $570,000 is up 4% as compared to March last year and 1% down from February asking price. Realestate.co.nz: data compiled from asking prices of new residential listings as they come onto the market via subscribers to the realestate.co.nz website. Realestate.co.nz website currently has over 93% of all licensed real estate offices subscribing and providing all of their listings onto the website. REINZ: data compiled from reported unconditional residential sales from all members of the Real Estate Institute of New Zealand representing all licensed real estate offices. QV: data compiled from residential sales compiled by QV for the previous 3 month period. With the largest database of properties for sale in NZ, realestate.co.nz is uniquely placed to immediately identify any changes in the marketplace. Realestate.co.nz Property Report is compiled from new listing coming onto the market from the more than 1,150 licensed real estate offices across NZ representing more than 93% of all offices. With a monthly level of over 12,000 new listings the Realestate.co.nz Property Report provides one of the largest monthly sample reports on the residential property market as well as a more timely view of the property market than any other property report. The data is collated and analysed at the close of each month and the Report is compiled for the 1st day of the following month providing a feedback mechanism for the immediate state of the market well in advance of sales statistics which by the very nature of the selling process can reflect activity with a lag of between 2 and 4 months. In analysing the details of the 13, 284 new listings in the month of March a total of 447 listings have been excluded due to anomalies. The categorization of Lifestyle property is defined by the land area of the property, the criteria is of a property having in excess of 0.3 hectares and being situated outside of metropolitan areas. Realestate.co.nz is the official website of the real estate industry of New Zealand, it is an industry owned website providing online marketing services to the real estate industry. The website is the most comprehensive website for real estate in NZ currently hosting over 115,000 listings covering residential property for sale and rent, commercial property for sale and lease, rural properties and farms as well as businesses for sale. With a subscriber base of over 1,150 offices the website features over 90% of all listings from licensed real estate agents in NZ. Realestate.co.nz receives over 350,000 unique browsers from both domestic and international visitors. The website is the most popular website for international visitors enquiring of NZ real estate with over 100,000 unique browsers per month from more than 200 countries.